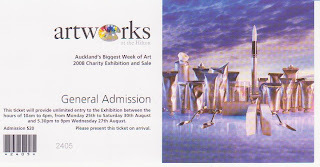 We are proud to offer free tickets (while supplies last) for Auckland's Biggest Week of Art Charity Exhibition and Sale. Tickets ($20 value) provide unlimited entry to the exhibition between the hours of 10am to 4pm, Monday the 25th of August to Saturday the 30th of August. And, 5:30pm to 9pm Wednesday the 27th.